The name of the South American country is "Colombia," not "Columbia." (Image via It's Colombia, NOT Columbia on Facebook). "Colombia" is the country; "Columbia" is the Ivy League school. Adidas made this unfortunate, but all too common, error in an advertising campaign promoting the uniforms the country’s soccer team is wearing in the Copa America, the international soccer tournament happening across the U.S. this month. The apparel company issued a statement to media outlets saying, "We value our partnership with the Colombian Football Federation and apologize for our mistake. We removed these graphics and are quickly installing new versions today." The country has worked with Adidas since 2011. Presumably, it Googled the name of the country before drawing up earlier versions of its kit. The Copa America has also been plagued by numerous national anthem blunders in its opening days. On Sunday, officials played the wrong anthem for Uruguay’s squad before its game against Mexico. A day later, the Pitbull song "Mr. Worldwide" interrupted Chile’s anthem before a game in Santa Clara, California. 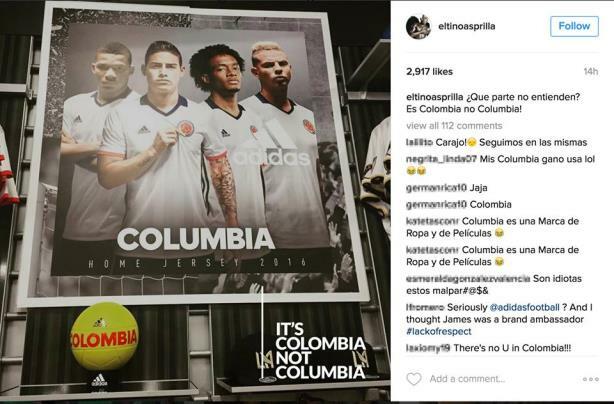 Fans of Colombia’s soccer team (and fact checking) reacted furiously to the flub on Twitter.